Rep. Carlos Curbelo, a carbon tax supporter, lost to his Democratic opponent. Other GOP lawmakers on the Climate Solutions Caucus were also defeated. “[Y]et another sign that carbon taxes are politically toxic,” conservatives said. Florida Rep. Carlos Curbelo, who supports a carbon tax, was among defeated House Republicans who are part of a caucus set up to push global warming policies. “Curbelo could and should have been re-elected but he was talked into pushing an energy tax on all Americans — the so-called carbon tax — and as a result voters kicked him out of office,” Grover Norquist, president of Americans for Tax Reform (ATR), said in a statement. Curbelo’s concession was just the tip of the iceberg when it came to defeats for Republicans in the Climate Solutions Caucus (CSC), a bipartisan group meant to put forward policies aimed at addressing global warming. For critics, Curbelo’s loss echoes the primary loss of former South Carolina GOP Rep. Bob Inglis in 2010. Rep. Trey Gowdy handily defeated Inglis in the primary, largely because of Inglis’ support for a carbon tax. Curbelo introduced legislation in July to tax carbon dioxide emissions at $23 per ton, which would mostly go towards the Highway Trust Fund. Few elected Republicans support a carbon tax. 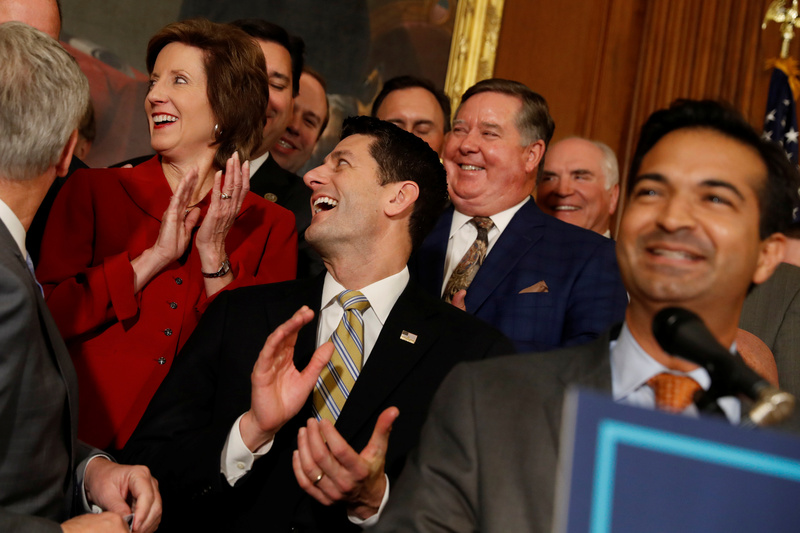 House Republicans, including Speaker of the House Paul Ryan and Rep. Carlos Curbelo (R-FL), celebrate at a news conference announcing the passage of the “Tax Cuts and Jobs Act” at the U.S. Capitol in Washington, U.S., November 16, 2017. REUTERS/Aaron P. Bernstein. However, Curbelo’s support for a carbon tax only earned him attacks from the right and left. The free market American Energy Alliance bought attack ads against Curbelo, and environmental groups backed his opponent. “He was savaged by groups including the Sierra Club and Tom Steyer’s NextGen America, which endorsed his Democratic opponent,” Steve Milloy, a Trump transition team member, said in an emailed statement. Steve Valk, communications director of the Citizens’ Climate Lobby, said that while CSC Republicans took a beating Tuesday night, he was confident more on the right would join the caucus. “Yes, the Republican ranks on the caucus have shrunk tonight, but at the start of the 115th Congress there were only 6 Republicans on the caucus and that number grew to 45,” Valk told The Daily Caller News Foundation. 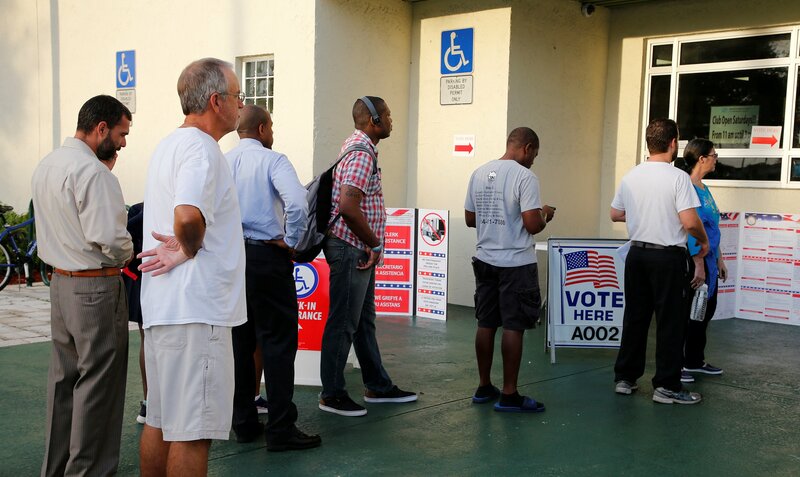 Voters line up to vote in the U.S. midterm congressional and gubernatorial elections in Deerfield Beach, Florida, U.S. November 6, 2018. REUTERS/Joe Skipper. Citizens’ Climate Lobby helped form the CSC in 2016. Curbelo and fellow Florida Rep. Ted Deutch, a Democrat, served as the caucus’s first chairmen. Curbelo’s defeat is a blow to his carbon tax bill, but Valk pointed out that two of the bill’s cosponsors won re-election. GOP Reps. Brian Fitzpatrick of Pennsylvania and Francis Rooney of Florida won their races Tuesday night. Both Fitzpatrick and Rooney also voted against an anti-carbon tax resolution introduced by House Majority Whip Steve Scalise. “With engagement and support from constituents in their districts, we think other Republicans will come on board to replace the ones not coming back,” Valk said. Content created by The Daily Caller News Foundation is available without charge to any eligible news publisher that can provide a large audience. For licensing opportunities of our original content, please contact[email protected].